As anyone who’s been lucky enough to experience the throaty growl of a Porsche, or the machine-gun-in-a-hurricane whine of a Ducati, can testify, the confluence of beauty, power, and speed can be magical to the ear. 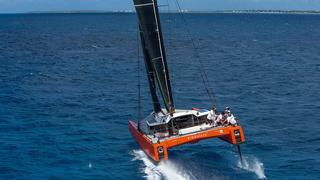 But none of us lucky few aboard for the first “flight” of the remarkable G4 from Gunboat, named Timbalero3, is prepared for the harmonics created when this 12.2-metre, 2.67-tonne, bright orange catamarn rises up out of the water on a single carbon-fibre hydrofoil and “flies” at a top speed of 31.9 knots in about 18 knots of wind. The sound of speed is almost mystical; like whale song, or what some religions refer to as “om” – the sound of the universe. 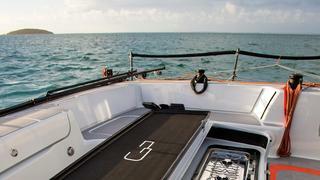 No internal combustion engine is capable of that – nor do most performance machines have sleeping accommodation for six, a fully equipped galley and the ability to transport you to a tropical island in the trade winds. 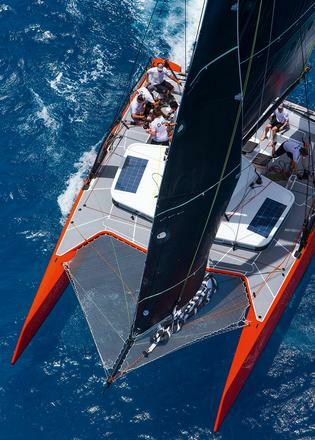 But then again, there has never been anything quite like the G4, as seen in the video when she capsized during Les Voiles de St Barth in the Caribbean. 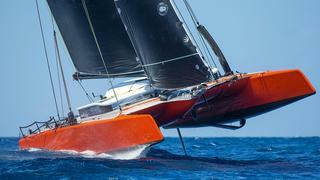 I join the boat during its first days of testing in the Bay of Marigot off the French side of St Martin/Saint Maarten. On board are Gunboat founder Peter Johnstone, a team of very smart, very tall and very Dutch designers and builders from Holland Composites, who’d spent 18 months fully immersed in doing the impossible – helping design and build an all-carbon, fully foiling cruising catamaran – and a number of world renowned speed sailors. These guys had seen and done it all, but still the sense of anticipation is palpable as we motor out of harbour on Timbalero3’s single retractable electric engine and raise the sails. 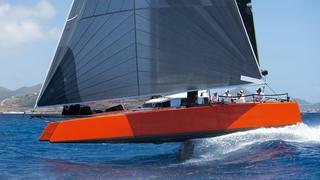 We are about to do what no one else has done before – sail the first fully foiling cruising boat at well over 30 knots. Anticipation turns to action pretty quickly. Once the jib sheet and the main traveller are trimmed by the crew on the windward hull, and the mainsheet is trimmed by the helmsman with an ingenious oscillating foot pump that controls the hydraulics of the mainsheet system, we are suddenly going very fast. Boat speed hits 15 knots almost immediately, then passes effortlessly through 16, 17, 18, then 20 knots. No problems; no dramas; no on-the-edge-ness that you’d experience doing much less speed on most other boats. Then the boat really starts to hum. Partial foiling, with the windward hull skimming along the surface, begins when boat speed hits 12-14 knots, and full foiling – with both hulls fully out of the water for a consistent length of time – starts at 18-20 knots. And remember, this head-turning catamaran has a huge cockpit, full 360-degree views and genuine living space in the main cabin. She has additional berths in the hulls, and even a head and proper galley. The G4’s never going to compete with a 12-metre charter catamaran in terms of accommodation, but this literally is a fully foiling boat with a fridge and kitchen sink. Past 20 knots and things get spiritual. The intoxicating om sound of speed feels like it’s being created by the foil in the water, but is actually coming from the significant apparent wind that’s generated at those high, yet highly manageable, speeds through the rig. Occasional spray shoots through the middle of the cockpit to keep us on our toes, and then the helmsman – former A-class catamaran world champion Mischa Heemskerk – trims the bows down a bit and I find myself calling out the speed as we foil past 25 knots, my voice getting a little “intense” when speeds nose past 28 knots and then beyond. We get used to the speed very quickly and start speed runs between St Martin and Anguilla – seven miles in a matter of minutes. Never does the cat feel out of control or uncomfortable, and not once do we fall off the foils, spin out or break a single thing on board (except some personal sailing speed records). In fact the boat is so forgiving, and has such a wide groove, that at 25 knots we’re able to talk and joke, and even pass out water bottles from the cockpit fridge. On one run I take the helm and steer without issue, the feedback from the helm positive and responsive and I’m convinced that with a bit of practice any experienced sailor could helm this incredible flying machine. All on board still grip a little tighter as the boat edges up to 30 knots. But the intoxicating hum just gets louder, the rudders sizzle and both hulls fly even higher. Trim is called constantly over the rush of the wind and virtually all the available energy from the breeze gets transmuted into forward motion. I’m sailing in three dimensions. I’m flying. I’m at one with the universe and nothing will ever be the same again.